This very unusual and colorful plant is a slower growing succulent with dark green leaves and dark stems. It is an excellent house plant for a sunny window. It is native to Africa and likes to go dry between waterings. 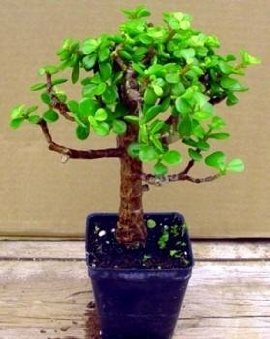 It is also excellent for bonsai! It has a pale pink flower. The fleshy trunk, branches and leaves are able to store water for a long period of time which makes it particularly well suited for offices, dormitory rooms, or anyone not wanting to be a slave to their plants. The plant you will receive is similar to the one pictured above. It is growing in a 4" Pot, about 8" tall and well rooted. The trunk is one inch in diameter. All you need is a bonsai pot!